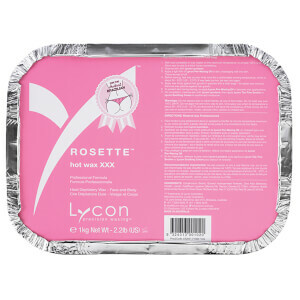 The same magical performance as the LYCON Hot Wax range, but LYCOJET can be used much thinner, so is more economical. Removes hair as short as 1mm, gently, thoroughly and painlessly for most. Exotic red with calming Chamomile and Rose. Excellent for all waxing and fabulous for Brazilians! I really find the Lycojet really does pick up the hairs as short as 1mm. I highly recommend you to use the pre wax oil beforehand. The method I have found best that works for me is I remove the majority of the hair with the Rosette which is gentle on the skin and then go over afterwards with the Lycojet as it picks everything else up and they is no need for any tweezing.